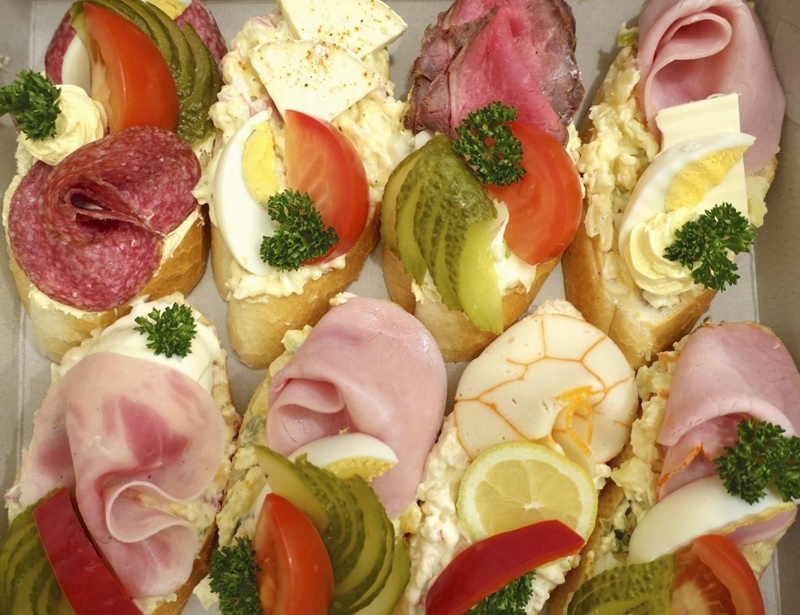 Lahůdky Zlatý kříž (Golden Cross Delicatessens) are home to the traditional gourmet open sandwich - chlebíček. We are proud to offer over 50 varieties, from classics to more exclusive creations, in typical 13cm and longer 18cm lengths. The Czech chlebíček is a world phenomenon - surviving over a century. Why do Czechs like it so much? It is a little edible work of art, visually appealing with its rich colors and textures. Its compact size makes it the perfect food on the go, a satiating quick lunch and the perfect addition to parties, celebrations and office bashes. It is tasty, filling and fun to eat! The chlebíček is quite simply a delectable treat. The wide array of toppings is sure to please every taste. 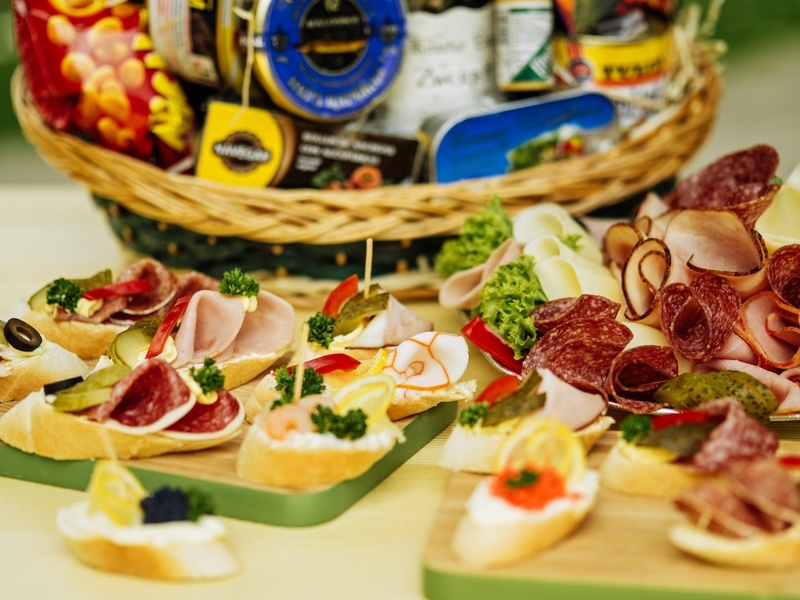 Our most popular choices include ham on potato salad, ham and cheese, Russian egg, hermelín (Czech cheese similar to camembert), crab, roast beef and various ham and cheese combinations. Visit one of our main location to get an authentic taste of the world-renowned Czech delicacy - the chlebíček. Zlatý Kříž Delicatessens prepare most of their savory items on location, so that our customers always enjoy the freshest ingredients. We offer over 30 varieties of salads with or without mayo, fried delicacies and aspic tubs. To satisfy your sweet tooth, choose from our wide selection of traditional Czech pastries, available in classic and mini sizes. We also offer cut smoked meats, cheeses, alcoholic and non-alcoholic beverages, as well as draught beer. For all your private celebrations and office parties, choose from cold cut platters, canapés, classic and mini open sandwiches, deviled eggs, aspic specialties and tailored savory cakes in any shape you desire (our aspic ham cake in the shape of a horseshoe is very popular, as well as our heart and Christmas tree shapes for a holiday themed look). Give a gift of tasty treats in our specially selected gift baskets, where you get to choose all that goes in: we just add the bow. Our main store is located in the charming Jungmann square (enter from Jungmannova street 34), adjacent to the picturesque gothic Church of St. Mary of the Snows and the enchantingly beautiful Franciscan Garden. This historical crossroad, extending to the popular Wenceslas Square, forms the 'golden cross', after which the name and logo have been created. So make a visit to these landmarks with a chlebíček in hand for a pleasant sightseeing opportunity. Or, enjoy a full lunch - a typical Czech schnitzel with potato salad and draught beer to refuel. We are sure to satisfy all tastes and time frames! Mr. Zoufalý first opened the doors of his Delicatessen on Jungmann Square over a century ago, selling French gourmet foods and seasonal Czech delicacies. Since then, the ownership of the store changed several times, but the tradition of this store and its products has continued for over 100 years! We look forward to seeing you at our deli stores and in Vortex Pub!